Galeon is bringing the outside in with its flagship 780 Crystal, which features huge retractable glass panels that make the yacht feel like an open boat. The main deck of the 24.5m yacht is flooded with light from broad side windows, large sliding doors and in particular, an automatic glass panel roof. ‘It’s like a sunroof – the idea is that it makes you feel like you are in something between an open boat and a full flybridge,’ says Aleksandra Brzozowska, marketing manager at Galeon. This enthusiasm for the outdoors continues in the boat’s Tony Castro-designed exteriors, which offer prodigious deck areas for a boat of this size. A clever seating arrangement on the flybridge frees-up more space, which is used for comfortable sunbeds, a second steering station, wet bar and even an optional spa pool. On the main deck the saloon is divided into two main areas, one with sofas, bar and entertainment systems and one with a specious galley and a dining table for six. The helm station provides excellent visibility and functionality, while an extra sofa and a slide-down window will be appreciated by the captain’s guests. Further down the unusual features continue. The owner’s cabin features a lounger with a massage function, as well as a walk-in wardrobe with a built-in safe for valuables. The forward VIP cabin has a huge overhead skylight and over the bed an LED panel that imitates the night sky. The two guest cabins, with twin berths are located on either side of the lower deck. All cabins have en suites and numerous windows and portholes providing natural light. 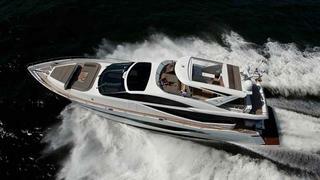 The 780 Crystal’s MAN engines offer 3,600hp. Her world premiere will be at the Festival de la Plaisance de Cannes, 6-11 September.